I am sitting on the patio, admiring the lushness that surrounds me. The grass is emerald green and the tree canopy hangs heavy. The roses, hydrangea and lilies are in full bloom. 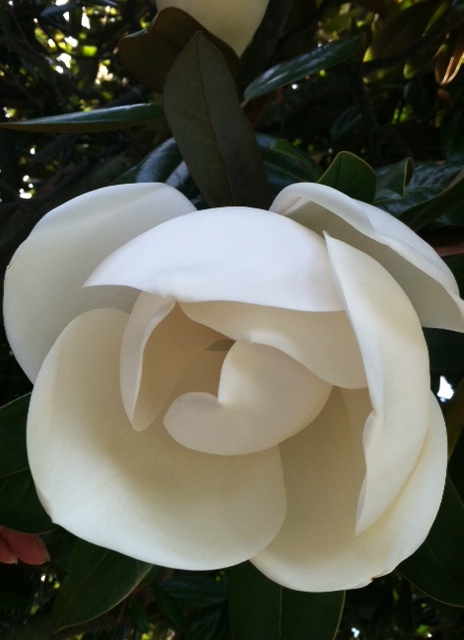 The heavenly scent from the pearly blossoms of the magnolia tree drift my way. The vegetable garden looks the same: luxurious. From the tomatoes to the root vegetables, all signs point to an abundant harvest. Though CRR and I would like to pat ourselves on the back for this lush valley of vegetation, credit in reality goes to Mother Nature. We awoke to 0.8 inches of rain this morning, putting our precipitation to date (June 23) half-an-inch over the average of 18.73 inches for the Washington, D.C area. By the summer solstice of 2012, the rain gods had sent us just 12.53 inches. We were watering like crazy to fight off drought. As a farmer’s daughter, I am very aware of the blessings and heartache of the weather patterns. An inch of rain in mid summer would send the farmers into town to celebrate the “million-dollar rain”, which would invariably make the crop. A dry spell would crease my father’s brow with worry. While I sit here enjoying a lazy late afternoon, I am wondering when the latest bout of violent weather will shift eastward. Tornadoes and storms in my native South Dakota this weekend crushed private planes like small toys and lifted houses off their foundations. At the same time, practically the entire nation west of the Mississippi River is suffering various stages of drought, from moderate (D1) to exceptional (D4), according to NOAA. That kind of weather – the type that draws news coverage – we can all do without. It seems like the kind of summer that should turn climate change doubters into believers.